The Choconut Valley Riders Snowmobile Club was established in 1993 by Geoff Cook. Geoff served as the clubs 1st president where he and the members Incorporated the Club and purchased the first 2 groomer sleds and drags for the Club in 1996. In 2003 and 2006 two additional groomer sleds and several drags were built and purchased to go along with the 2 original groomers and the 3 privately owned groomers of members Tom Norton, Denny O'Reilly, and Mark Uhouse to provide 7 machines to sustain our trail system. 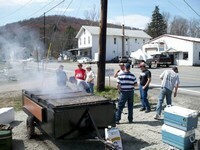 2009 Chicken Barbeque HERE Our trail system is comprised of nearly 100% private landowners throughout the Choconut Valley region in Susquehanna and parts of Bradford County in Northeast Pennsylvania. It is a trail system which operates under strict landowner approval and enforcement of rules and regulations of our 186 family and individual members. It is with great pride and many thanks to our membership and Business Sponsors and most of all our Landowners who provide us with the trail system for our snowmobile enjoyment. Meetings are the 2nd Tuesday of the month, 7:30 P.M. at Choconut Inn, Choconut, PA.
See Qwikcast.com forecast for Brackney, PA, US (Susquehanna county) .